GERARDI VAN SWIETEN MED. DOCT. COMMENTARIA IN HERMANNI BOERHAAVE APHORISMOS DE COGNOSCENDIS ET CURANDIS MORBIS - EN 5 TOMES - TOMES 1 + 2 + 3 + 4 + 5 . - Roma, 1773 circa. Dalla serie "Vedute di Roma disegnate e incise da Giambattista Piranesi Architetto veneziano" (Mogliano Veneto, 1748 &#150; Roma, 1778). Incisione in rame all&#146;acquaforte e bulino, b/n, cm 41,5 x 66 (alla lastra), firmata "Cav. Piranesi F.", in lastra, in basso a sinistra, in prima tiratura settecentesca, filigrana in doppio cerchio . Alcune tracce di umido, peraltro a pieni margini e in brillante inchiostratura. Nouvelle Carte De L'Isle De Java, Dressée suivant les Observations les plus recentes, faites par ordre de la Comp. Holl. des Indes Orientales. - Nieuwe Kaart Van Het Eiland Java, Geschikt volgens de jongste Waarneemingen op Order der Nederlandsche O.I. Maatschappy gedaan. - J.v. Schley direx.':. - Kupferstich v. Jacob van der Schley n. Jacques Nicolas Bellin aus Francois Raynal, Atlas portatif ., 1773, 22 x 43,5 Tooley's Dic. of Mapm., S. 565 f. (Jacob van der Schley). - Zeigt die Insel Java. - Oben rechts Titelkartusche. - Unter der Karte zusätzlicher niederländischer Titel. London, Benjamin White, 1773. 4to (307 x 265mm). pp. (2), 8, (22), 63, (1), (4), with 120 fine hand-coloured engraved plates. Contemporary green half morocco, spine in 6 compartments with gilt ornamented butterflies, lines and lettering. Second edition. The first edition was published 1747-49, by the same publisher. One of the most beautifully illustrated works on English butterflies and moths, most of the plants, fruits, and flowers of the fine plates are after drawings by George Ehret and Jacob van Huysum. In the preface of the present work Henry Baker, who compiled the text for Wilkes, writes: "As to the Plants, Flowers and Fruits, he [Wilkes] declares himself under the highest obligation to a most curious Naturalist, and worthy member of the Royal Society of London, whose costly and valuable Collection is known to the learned world, and esteemed as it derserves. This Gentleman has generously permitted him to make use of many excellent Paintings of these subjects, which were taken from Nature by those two celebrated Artists Mr. George Dennis [sic] Ehret, and Mr. Jacobus van Heysum [sic], and executed with the utmost Judgment and Command of Pencil, so that he could hardly doubt but that the true Copies of them would give great Pleasure to the Lovers of Botany, whom he has endeavoured to entertain with all the Variety he could introduce". The 'most curious Naturalist' is Joseph Banks who had purchased some 65 finished drawings by Ehret. "Benjamin Wilkes was one of the most significant of the group of eighteenth-century 'aurelians' which established British entomology in the direction it was to follow for well over a century" (Wilkinson, Benjamin Wilkes, the British Aurelian p. 4). It has only recently been rediscovered that the plates of Wilkes' work were to a large extent after drawings by the most renowned botanical painters of the 18th century, George Ehret 'Flower painter extraordinary' and Jacob van Huysum. A fine copy .//Nissen ZBI, 4410a; Lisney 186. Della città di Aveia ne Vestini ed altri luoghi di antica memoria. Dissertazione. Giovanni Zempel, Roma 1773 - Legatura coeva in pergamena con segni di sofferta umidità (aloni e cuciture allentate). Carta forte. Lozzi, 261 raro . 4to (cm. 26,2), 4 cc.nn., 162 pp., 1 c.nn. Frontis. in rosso e nero con graziosa incisione. Alcuni disegni n.t. GAUTIER D'AGOTY ARNAUD - ELOI. Cours complet d'anatomie, peint et gravé en couleurs naturelles par A. E. Gautier D'Agoty, second fils; et expliqué par M. Jadelot. Nancy, Jean - B. H. Leclerc, 1773. 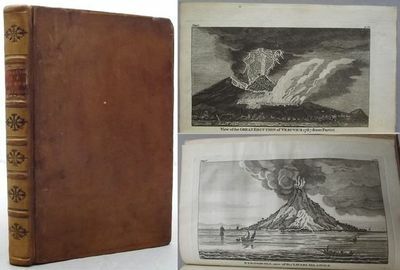 1773 In - folio massimo; 2 cc., 25 pp., 15 tavole incise in rame e stampate a colori; legatura coeva in mezza pelle (minimi restauri). Buon esemplare marginoso, qualche gora e cancellazione di un segno d'appartenenza al titolo, piccolo strappo al margine bianco di una tavola senza alcuna perdita. Prima edizione. Opera anatomica di grande bellezza, una delle più significative produzioni dei D'Agoty con le celebri incisioni in policromia. L'invenzione della stampa a tre colori di Christian Le Bon (1667 - 1741) era stata poi sviluppata in quadricromia da Jaques Fabien Gautier, padre di Arnaud - Eloi. Choulant Frank, History and bibliography of anatomic illustration, p. 273. Wellcome III, p. 97. F. Rodari, Anatomie de la couleur. L'invention de l'estampe en couleurs, exposition Paris - Lausanne 1996. De natuurlyke historie der versteeningen, of uitvoerige afbeelding en beschryving van de versteende zaaken, die tot heden op den aardbodem zyn ontdekt: . Uit het hoog- in 't nederduitsch vertaald door M. Houttuyn, met verscheide aanmerkingen. 1773. Le Blanc: Manuel de l'Amateur d'Estampes (Paris, 1854-90) 2. The "Concert Spirituel," a concert series founded in Paris in 1725, "was at the centre of Paris';s non-operatic musical life until the founding of the Concert des Amateurs (1769). The last director, Bertheaume, abandoned the enterprise after the 13 May 1790 performance. 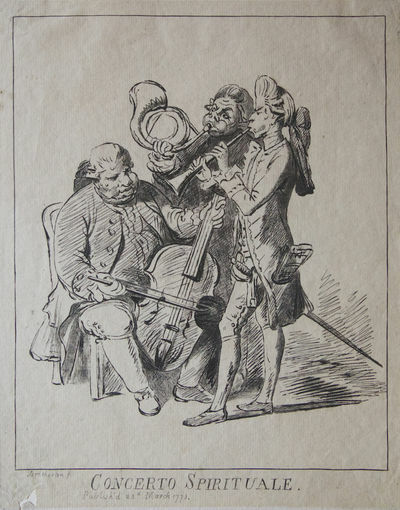 Concerts spirituels, not connected to the original series but consisting of programmes on the Parisian model, or simply of sacred music, had been given in Vienna and other European centres beginning in the late 18th century; in Paris, theatre orchestras and concert societies began giving them during the French Revolution. They continued during periods of royalism and eventually became part of the tradition of the Société des Concerts du Conservatoire." Eric Bloom and Beverly Wilcox in Grove Music Online.. Sheet size ca. 262 x 206 mm., plate size ca. 257 x 200 mm. Signed in the plate. A fine, bright impression on laid paper with narrow margins. Lightly browned; a few small spots of light foxing; small hole to blank lower left corner; hinged at upper margin of verso. Roma, Zempelliano, 1773. Folio (380 x 255mm). pp. xl, 260, with 1 fine engraved allegorical frontispiece, 1 engraved title vignette showing a cabinet and 2 scientists with a magnifying glass, 10 engraved vignettes in the text and 51 engraved plates. 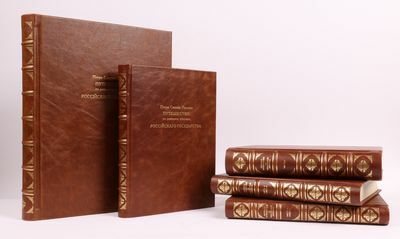 Contemporary half calf, gilt ornamented and lettered spine in 5 compartments, marbled sides. "Very scarce. Revised and edited by Giuseppe-Antonio Battarra. Kircher, the great German Jesuit scholar, had formed during his life a magnificent collection of antiquities and natural history specimens. When he died in 1680, the collection was bequeathed to the Collegio Romano. Although Buonanni published a one volume account of the collection in 1709, this much enlarged work is the definitive edition. The volumes cover mainly zoology, paleontology, and conchology, and are superbly illustrated. It is one of the most important accounts of a seventeenth century scientific cabinet. Volume 1 divides the text into classes of (1) quadrupeds, (2) reptiles and insects, (3) fossils, minerals and stones, (4) fish and sea creatures, and (5) apparatus. Pages 94-152 describe the mineralogical specimens, including gold, silver, copper, iron, lead, tin, mercury, antimony, magnets, marcasite, salt, sulfur, amber, dendrites, fossils, the Philosopher's stone, etc. Some of these are illustrated on plates XXXV-XXXVI" (C. Schuh, Bibliography of Mineralogy). Volume 2, not present here, deals almost exclusively with shell and bivalve descriptions. A few leaves with some worming at the lower margin. A very fine copy.//B.M.(N.H. ), 287; Nissen ZBI, 2199. Veduta sul Monte Quirinale del Palazzo dell'Eccellentissima Casa Barberini, Architettura del Cav. Bernino. Roma, 1773 circa. Dalla serie ?Vedute di Roma disegnate e incise da Giambattista Piranesi Architetto veneziano? (Mogliano Veneto, 1748 ?" Roma, 1778). Incisione in rame all'acquaforte e bulino, b/n, cm 41 x 62 (alla lastra), firmata ?Piranesi fece?, in lastra, in basso a sinistra, sei didascalie al margine inferiore, in prima tiratura settecentesca, senza filigrana. Alcune tracce di umido, peraltro a pieni margini e in brillante inchiostratura. OBSERVATIONS ON MOUNT VESUVIUS, MOUNT ETNA, And Other Volcanoes: In a Series of Letters. Addressed to The Royal Society, From the ... To which are added, Explanatory Notes by the Author, hitherto unpublished. Recueil des antiquités et monumens marseillois qui peuvent intéresser l'histoire et les arts. Veduta degli avanzi del Castro Pretorio nella Villa Adriana a Tivoli. Roma, 1773 circa. Dalla serie ?Vedute di Roma disegnate e incise da Giambattista Piranesi Architetto veneziano? (Mogliano Veneto, 1748 ?" Roma, 1778). Incisione in rame all'acquaforte e bulino, b/n, cm 38 x 66,5 (alla lastra), firmata in lastra, in bs. a sn., ?Cavalier Piranesi delin. e inc.? ; più al centro, nella parte figurata, il numero "127", senza filigrana al verso. Alcune pieghe del foglio e alcuni strappi marginali, peraltro a pieni margini e in buona inchiostratura. chez Marc Michel Rey 1773 12mo (cm. 16,6), XXIV - 432 pp. Legatura coeva in piena pelle con nervi, ricchi fregi e titolo oro su tassello al ds. (tracce dâ??usura). Tagli rossi. Mancanza alla cuffia superiore e piccola abrasione al piatto anteriore. Ottimi interni. Allâ? ?occhietto â? ?TraitÃ© des Fonds de Commerce, ou Jeu dâ??Actionsâ??. Rarissima seconda edizione accresciuta. Non in Einaudi nÃ© in Goldsmith. Presente, secondo ICCU, in una sola Bibl. italiana. Lima: En la Oficina de la Calle de S. Jacinto, 1773. Two volumes. ,207,pp. plus fourteen unpaginated leaves which appear between sections; ,306,pp. plus five unpaginated leaves which appear between sections. Small quarto. Contemporary limp vellum, lettered on spine. Bookplate on front pastedowns. Several ex-lib. ink stamps on titlepages, one of which has been cut away from text and the page subsequently backed with paper. Some light foxing. About very good. An important collection of documents on the Jesuit order in Peru, which primarily discusses the dispersal of the Order's property after their expulsion from America. The Jesuits were expelled from Peru, as well as other Spanish and Portuguese possessions, in 1767. Also included here are the constitutions of several schools which were under their provision. Published in two parts, both of which are present here. MEDINA (LIMA) 1338, 1358. VARGAS UGARTE 2056, 2078. Opera omnia. Ex recensione Jo.Augusti Ernesti qui et notas suas adiecit. Reise auf den Glockner. 2 Teile in einem Band. Wien, J. V. Degen 1804. 8°. XXVI, 1Bl., 349 S.; 2 Bll., 366 S., mit 4 Kupfertafeln u. 1 (mehrf. gef.) Kupferkarte, Hlwd. um 1900 mit Rtit. Roma, 1773 circa. Dalla serie ?Vedute di Roma disegnate e incise da Giambattista Piranesi Architetto veneziano? (Mogliano Veneto, 1748 ?" Roma, 1778). Incisione in rame all'acquaforte e bulino, b/n, cm 41,5 x 66 (alla lastra), firmata ?Cav. Piranesi F.?, in lastra, in basso a sinistra, in prima tiratura settecentesca, filigrana in doppio cerchio . Alcune tracce di umido, peraltro a pieni margini e in brillante inchiostratura. La Situation de La Pologne en MDCCLXXIII. - Die Lage des Königreichs Pohlen im Jahr 1773. - J.E. Nilson, fec. et excud. A.V.':. - Kupferstich v. Johann Elias Nilson in Augsburg, dat. 1773, 29 x 19 Karikatur auf die erste Teilung Polens. - Zeigt Friedrich den Großen, Joseph den Erzherzog von Österreich, Katharina die Große und Stanislaw August König von Polen (?) mit einer Karte von Polen in der Hand, die sie zusammen festhalten. - Über der Darstellung Engel mit Posaune und drei Bannern. - Seltenes Blatt! Caricature on the first partition of Poland. - Displays Frederick the Great, Joseph the Archduke of Austria, Catherine the Great and the King of Poland Stanis?aw August with a map of Poland in hand. - About the illustration Angel with trombone and three banners. - Rare sheet! Gessner, Salomon et D(iderot, Denis). Birmingham: John Baskerville, 1773. 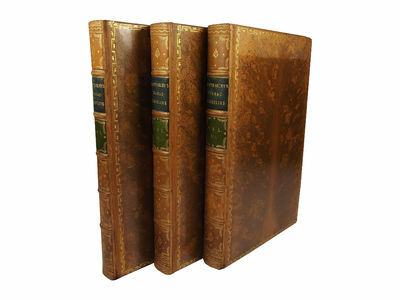 Three volumes complete - Volume One - , iv, , 364pp; Volume Two - 1-176, , 181-443pp,  and Volume Three - , 410pp, . Later full tree calf, raised bands, spines in six panels, title label to second panel, contrasting volume label to third, remaining panels gilt with leafy stem corner pieces and seed head and leaf centre piece, covers with rolled border, gilt roll to edges and inner edges, a.e.g and marbled, with marbled endpapers. Spines slightly faded, with covers slightly unevenly faded, minor rubbing to extremities, corners lightly bumped. Internally some light soiling to margins, some off setting from engravings as usual, but generally fairly bright and clean. Previous owner's armorial book plate to front pastedowns (Christopher Turnor of Stoke Rochford), couple of old bookseller descriptions tipped on to marbled free endpaper. Engraved frontispiece by Gribelin and Closterman, the final engraving is by Gribelin and Mattaeis, the others all by Gribelin. The fifth edition, the first Baskerville edition. Gaskell 49. First Thus. Full Calf. Good+. Illus. by Gribelin. 8vo. Benjamin Franklin; Barbeu Du Bourg, M.
Manchester: John Heywood, Mid 19th century. Later printing. Hardcover. Very good +. 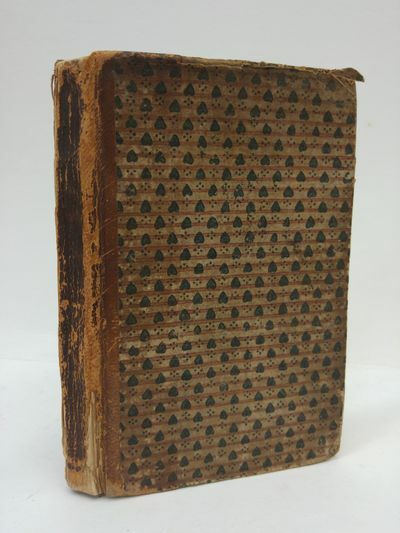 Reprint of 1773 original (ESTC T135972) by original publisher (1858,1860,1878). Half bound with title gilt bright, shelf wear to spine and corners. End papers pale yellow with book plate (blue) of J.S. Russell (possible 19th century clergy-author of The Parousia) to front paste down. Text block tight and unmarked with all plates (44), and letter press printing (To His Subscribers and Explanation of the Plates) present. London, Printed for A. Millar, 1773., 1773. 4to. Illustrated with 36 folding engraved plates with partial, light offsetting. 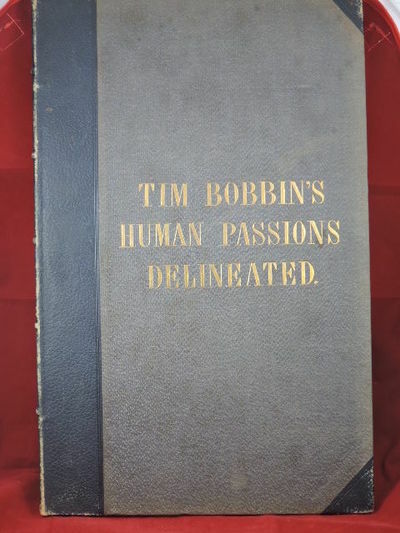 Full calf binding with red title label to spine. Levenside bookplate. Upper joint repaired. A superb copy. Ferguson's book was one of the first in English to deal extensively with mechanics and hydraulics and went through numerous editions until well into the nineteenth century. 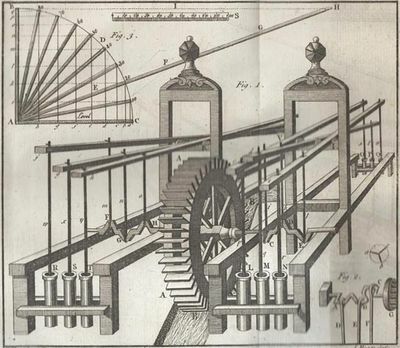 The plates of machinery after Ferguson's own drawings are attractive and skilfully executed. Scarce, especially in such fine condition. [with his] The history of the University of Oxford, from the death of William the Conqueror, to the demise of Queen Elizabeth. Oxford: Pr. by W. Jackson & J. Lister for J. & F. Rivington, 1773. 4to (27.3 cm, 10.75"). , 264,  pp. Bound together here are this author's first, 32-page history, tracing the story of education in Britain back to the Druids, and his much more extensive follow-up on Oxford's development including, e.g., passages on => politics, religious controversies, town-gown contretemps, and epidemics. Sir John Peshall (sometimes given Pechell, formerly Pearsall), sixth baronet, was a clergyman and antiquary known for his philanthropic activities; he was himself an Oxford man (BA 1739, MA 1745). Provenance: Front pastedown with bookplate of the famed Hookham Circulating Library. London: W. Bowyer and J. Nichols, 1773. Hardcover. Good. Collated with the old and modern editions. 207 pp. 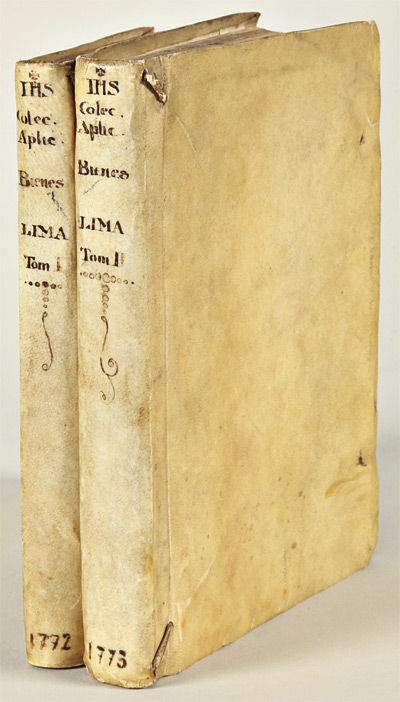 Leather spine with paper-covered boards. Leather worn and rubbed through, edges of boards rubbed through. Boards exhibit a nice pattern in pen and ink. Only minor foxing, else interior very nice, clean, binding secure. An early edition.Your purchase benefits literacy and summer reading programs in Cincinnati and Hamilton County, Ohio. We ship every business day. All books ship in cardboard bookfolds with delivery confirmation. Under the patronage of Catherine II, Pallas took charge of the scientific expedition whose initial task was to make astronomical observations in Siberia. Six years of travel took him as far as the Chinese border in the east and the Caucasus in the south. His discoveries and extraordinary hardships are documented in this work, first published in St. Petersburg.